The first time I saw a set of plots generated from the micro climate data gathered, I was deeply moved. Immediately I saw the colorful lines and dots without the numbers and words. To me they were images being ‘drawn’ by the forest revealing its secrets. To view more images from the series click here. During the closing reception there will be scientists, Fred Swanson, Julia Jones and others from the HJ Andrews giving brief talks about the important research being done in the forest as well as answering questions. We will have signed copies of books inspired by, and about, The Andrews. And we will debut a sound collage by Portland percussionist Lisa Schonberg from her environmental recordings made at the logjam on Lookout Creek (unfortunately this will not be live because she is currently working in Brazil). 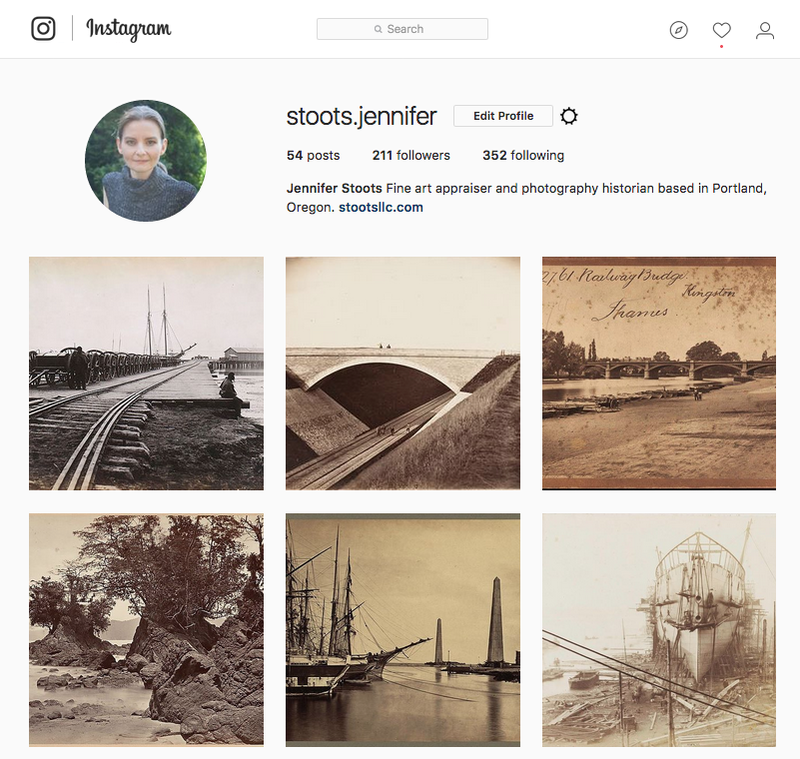 The multi-talented Jennifer Stoots finds yet another voice as she shares the most savory secrets of photographic history through her Instagram page. I can feel her passion in every expertly researched post. Like every good historian, she puts the image into context by weaving together general history, photographic history and the relevant details of the image maker's life. The art of what Stoots, as the photo world refers to her, does is to bring all this together in one Instagram post. This is Instagram at its best. Click the link, go to her page and follow her. I promise you - it's a very healthy addiction. Recently I sent a few work prints and a copy of Urban Forest to a favorite writer of mine. On the backs of two of the prints I wrote a note asking if he would be interested in writing an essay to go with this new work. We’ve never met or even spoken on the phone. Early in my photographic life his writing helped shape my ideas about our place, and my place, in the natural world. Writing to him was a brazen act of faith and hope. Three days later I received a typewritten note on his personal stationery. I hope you noticed the words ‘typewritten note’ because that alone was to me a treasure. Before I even read what he had to say, I felt rewarded with a measure of effort and time that is increasingly rare these days. He told me he knew of Urban Forest and was really drawn to the new images and the stories they contained, but he regretted having to decline the invitation to write an essay. A person of his stature does not even need to give a reason. And yet his was eloquently woven into a short story that was deeply human and filled with warmth. Even in his rejection he was teaching me about grace and kindness. A lesson I will embrace and do my best to emulate. His name is Barry Lopez. Just before Christmas Lea and I were thrilled to visit the new installation of fifteen photographs from my Falling Trees and Sap in Their Veins collections acquired last year by the Portland offices of the international law firm of Stoel Rives LLP. Last spring the art curator of Stoel Rives invited me to submit a proposal to their art acquisition committee. Touring the offices, I was wowed by the fabulous design concepts and happy to discover the luscious Columbia River Gorge photographs by the late Terry Toedtemeier are part of their corporate art collection. Early last year Stoel Rives LLP moved into the top six floors of a gorgeous new building along the Willamette River. The top two floors were designed expressly to showcase their significant art collection of mostly northwest artists like Chad Buck, Terry Toedtemeier and others. The flooring was milled from a single Oregon White Oak and all the conference rooms are named after Portland neighborhoods. Turning toward the center of the building a visitor sees the artwork and, looking outward, floor to ceiling views of the river, all six bridges, Mount Hood and Mount Saint Helens. It was an honor and a delight to see my work so beautifully presented. I am proud to be in this important Portland art collection. One year ago, on Thanksgiving Day, I signed a contract with The Bancroft Library at UC Berkeley to create The David Paul Bayles Photographic Archive. It was a major moment in my life, and I was delighted to share it with family. Last month I drove to Berkeley and placed more than a hundred photographs, oral history audio files, exhibition ephemera and some unique correspondence into the archive bearing my name. Eventually the archive will house my entire life's work. I am humbled and proud to be sharing this news with you. The Bancroft Library is the third largest special collection library in the country with over 16,000 research visits a year. It has the largest collection of artifacts on the development of the United States west of the Rockies. There are eight million photographs in the collection, with works by significant photographers, Ansel Adams, Carleton Watkins, Dorothea Lange and many others. It has been a pleasure to work with Jack Von Euw, Chief Pictorial Curator and Christine Hult-Lewis, Curatorial Assistant. Their guidance, expertise and support has been remarkable. Viewing prints for the Archive. L to R, Julie Musson, Digital Assets Archivist, Christna Hult Lewis, Curatorial Assistant and Jack Von Euw, Chief Pictorial Curator. Signing the contract in the studio with family on Thanksgiving Day, 2016. L to R, Jojo, Gabe, Emily, Lea, Juliana, Cliff, Ina, Felsha and Jon. Emma Kisiel is an insightful photographer and the author of a rich blog experience titled Muybridge's Horse. She is a passionate voice for all things flora and fauna. Her blog features the work of other photographers addressing themes around human-nature connections. Emma attended my presentation at SPE and has since featured images from my Working Forest project on her blog Muybridge's Horse. Two weeks ago Oregon State University hosted the Northwest Chapter of the Society for Photographic Educators conference. Associate Professor Julia Bradshaw and her team did a fabulous job creating and organizing the event that drew educators from Oregon, Washington, Idaho, Montana, Alaska and the Dakotas. Richard Misrach, one of my heroes and an early influence, was the Friday night keynote speaker. I gave a 45 minute presentation on Saturday morning entitled From Chainsaw to Camera, A Life with Trees. It was a lot of fun, once I got over the stage anxiety. In two weeks I will be giving a longer version of the same presentation to ALL, the Academy for Lifelong Learning here in Corvallis. Image courtesy of Greg Bal.